We’ll discuss which solutions will work best for your kitchen remodeling project in Collingwood, so you feel confident the end result will be exactly what you have envisioned. Is your kitchen outdated, and you would love to upgrade your cabinetry so it truly reflects the style and personality of your home? Are you a contractor who needs assistance with a kitchen remodeling project for one of your clients? Whether you are a homeowner or a contractor, at McMillan Millwork & Joinery, we are committed to providing high-quality products and services to meet your needs in Collingwood, Ontario and The Blue Mountains. With extensive knowledge of woodworking techniques and a collaborative approach to creating the perfect space, you will know you have come to the right place when you choose us for your next kitchen remodeling project. Looking for unique and modern kitchen designs? At McMillan Millwork & Joinery, we are committed to using quality materials with professional finishes that are the perfect combination of old-fashioned craftsmanship and modern production. After providing a free in-home consultation, we’ll discuss which solutions will work best for your kitchen remodeling project, so you feel confident the end result will be exactly what you have envisioned. Our goal is to provide elegant upgrades and additions that offer timeless beauty and lasting joy in your home. Let our 20 years of experience work for you when you are interested in only the finest-quality materials with your kitchen remodeling in Collingwood. 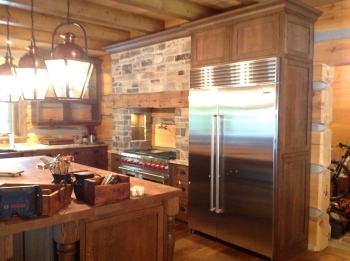 At McMillan Millwork & Joinery, we are driven to bring great designs to life, and we know you will love the results. Contact us today to learn more about our services and how we can help you achieve the kitchen of your dreams.